One of the perks of living in a coastal state is that fresh, wild seafood is just a car ride away. This fact does make me scratch my head, however, when I see seafood in our grocery stores from other places. Why? Why? It's just two hours down the road! One of Neil's friends is from Beaufort, SC and he and his dad are avid fishermen. On a recent visit to Columbia, Rick brought up tons of shrimp that he'd just caught. Beautiful, South Carolina shrimp, already bagged up in 1lb sizes for us...and getting the "friend price" is always nice as well! The thing about shrimp is, it's just like Bubba said in Forrest Gump; you can make a million dishes out of it. Endless possibilities. I needed some lunch, so here's what I did about it. 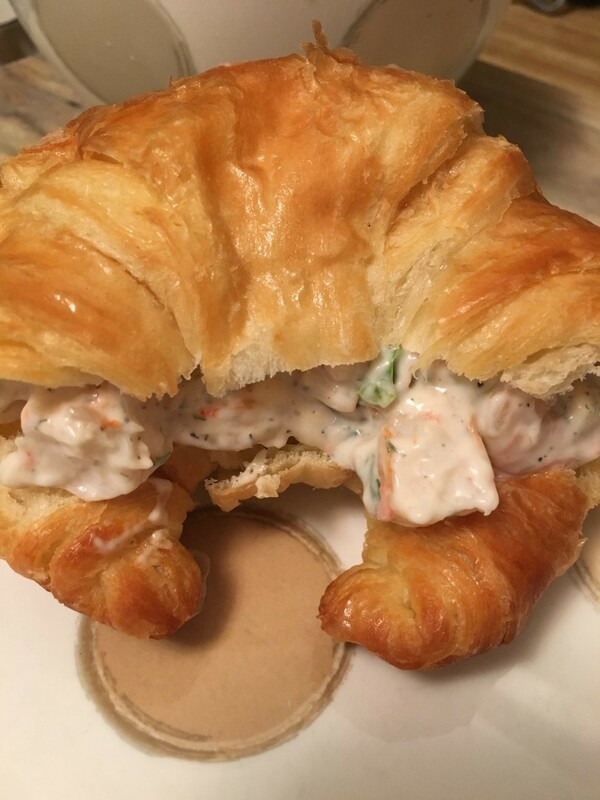 Shrimp salad on a flaky croissant. Yeah, I said it. I made a simple salad by gently poaching the shrimp in some homemade vegetable stock. As they cooled, I mixed some light mayo, sliced green onion, salt, pepper and dill weed. 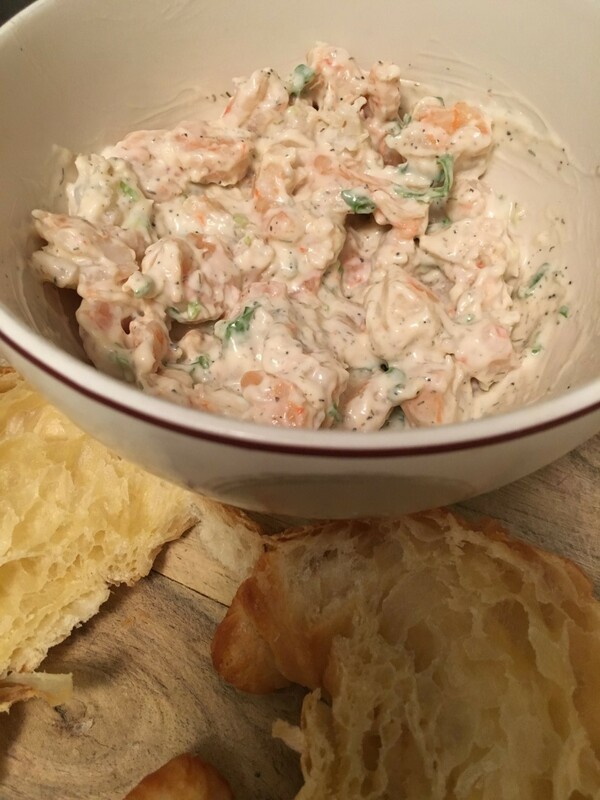 Stir, stir, stir and there's my shrimp salad. It was light, fresh and hit the spot. 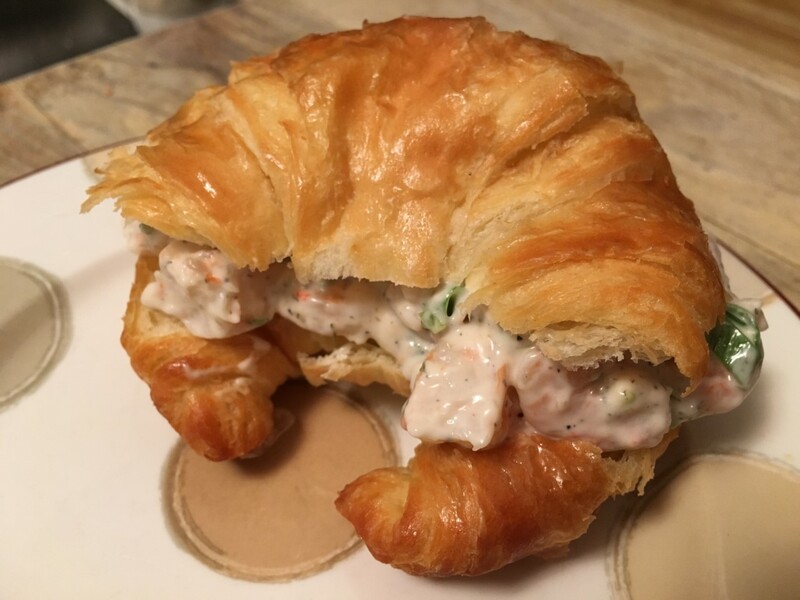 In a restaurant, this would likely be a $15 sandwich. Here at my house, about $2.50. Hmmm, I think I got the better deal.